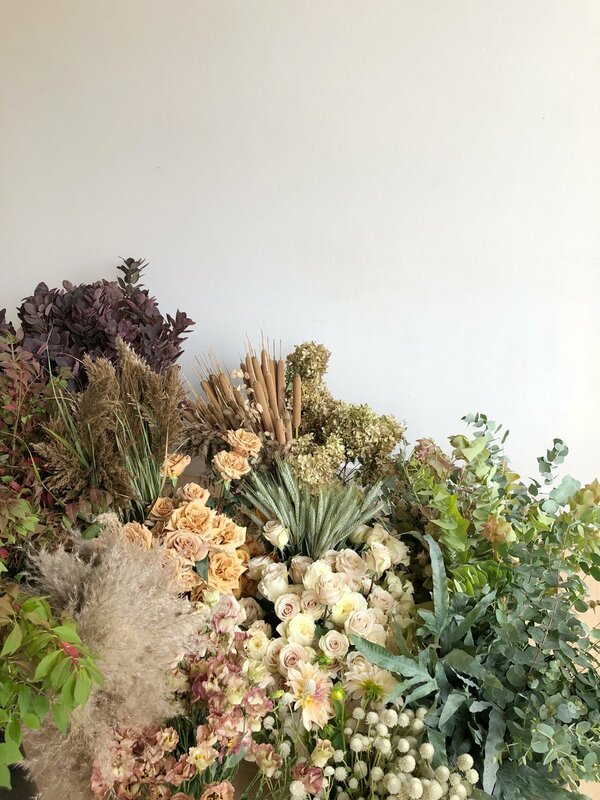 Another Fall Wedding Weekend — EVERGREEN FLOWER CO. This past weekend we designed for three beautiful weddings, all unique by way of products, color schemes, and order types. I remembered to grab that product shot this week, which I’m trying to make a weekly occurrence! Amy’s color scheme was inspired by golden fall tones, natural foliage changing with the season, and ferns. She opted for a pick-up option because the order wasn’t super large! Just a handful of centerpieces, bouquets, boutonnieres, a couple crowns, and a garland for the head table. All items that can easily be picked up! Sometimes a full-service option isn’t totally necessary! We have a $2,500 minimum for all full-service weddings, but we have a $500 minimum for pick-up orders! We would never want to discourage a potential client from reaching out to us even if their order is only bouquets and boutonnieres. We want to design special, unique items, no matter the order size! Thanks Jenna Powers Photography for taking a few film shots of Amy’s bouquet :) that’s Johni modeling it! Some really special local items in here! Sunny Meadows Flower Farm grew the sea oats and bittersweet. The cosmos were grown by Old Slate Farm! And the ribbon is silk gauze “coquille” from Frou Frou Chic. Katie’s wedding was a full-service wedding at Worthington Hills Country Club. I was so excited to design Katie’s bouquet because she was ready for something big, and dramatic! Originally, we were going to do all white flowers and greenery, but decided to add in a golden accent throughout the designs! We used locally grown eucalyptus and gomphrena from Sunny Meadows Flower Farm. The ribbon is also from Frou Frou Chic! It’s their “taupe rosature” silk gauze. Jenna also took a few film photos of Katie’s bouquet—it really pays to work in the same studio as a film photographer...! Mari, owner of Something Old Dayton, invited us back to design at another Gem City Pop-Up Wedding! 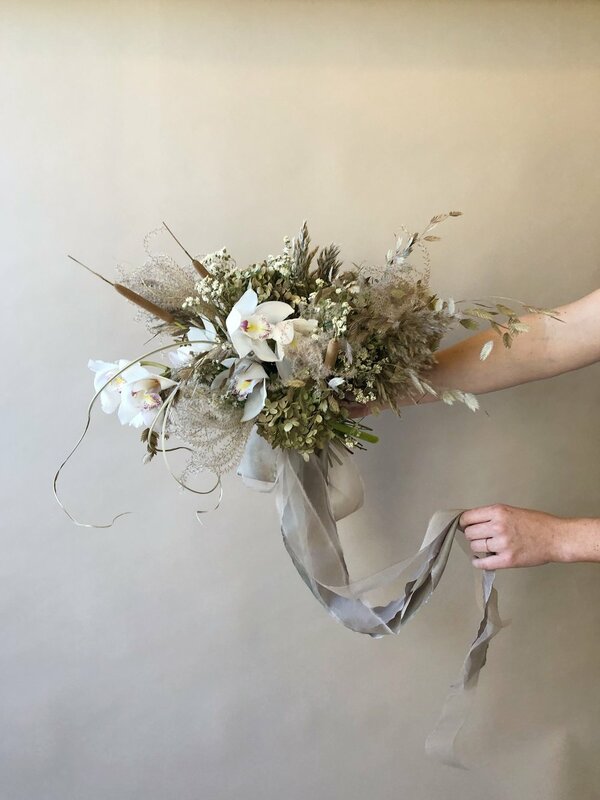 We used all dried product, except for the cymbidium orchids in the bouquets. The Pop-Up weddings are so fun—clients sign up for a time slot, invite their closest family and friends, and show up ready to go! The whole day is designed by Mari, and we absolutely love working with her on such a unique project!! We design a bouquet for each bride and a boutonnieres for each groom. We do one ceremony installation that lasts for through all ceremonies. “sauge” original silk ribbon and “chocolat pâle” organza silk ribbon from Frou Frou Chic. Since all of our product was dried, we opted to install and deliver on Friday for the Saturday Pop-Up weddings! We loaded up the elevator with the goods and headed to Dayton. Mari decided to host this Pop-Up wedding in their new space, which is on the second floor of the Davis-Linden Building. There were a few spots Mari was considering for the ceremony backdrop, so we took a few photos in each spot to see how the lighting would look, and if it would be too backlit by the windows. Option 1 - plain white wall - this is the wall we ultimately chose because it wasn’t backlit and we liked the idea of a blank space to work on! Option 2 - this corner had one solid wall and the other was a window, and this was a strong contender for the backdrop! Option 3 - this corner was all window, and all backlit, but those grasses do look beautiful with the sunlight shining through! Here’s a photo of Something Old Dayton’s new space! Mari texted me a few photos after we were done setting up—these are hers! Mari’s styling is always impeccable. We were absolutely in love with the dessert table setup! The sign was created by Linen + Poppi and the cakes are from Frosted! And of course those ceramic bowls are handmade by Bombabird. All rentals are from Something Old Dayton! Okay this is the coolest part. This fire escape is the guest entrance to the Pop-Up Wedding!! After we set up everything in Dayton, we headed back to Columbus to finish up our remaining designs. I ended up staying a bit longer and making a little arrangement for Jenna to take photos of...!! Saturday morning we got in at 7:30 to start boutonnieres and corsages. We always do those the morning of the wedding so they survive as long as possible! Saturday morning Amy’s friends stopped by to pick up her designs, and then we loaded up to head to Worthington Hills Inn to set up and deliver Katie’s designs! After I got back to the studio, I worked on another design just for fun.